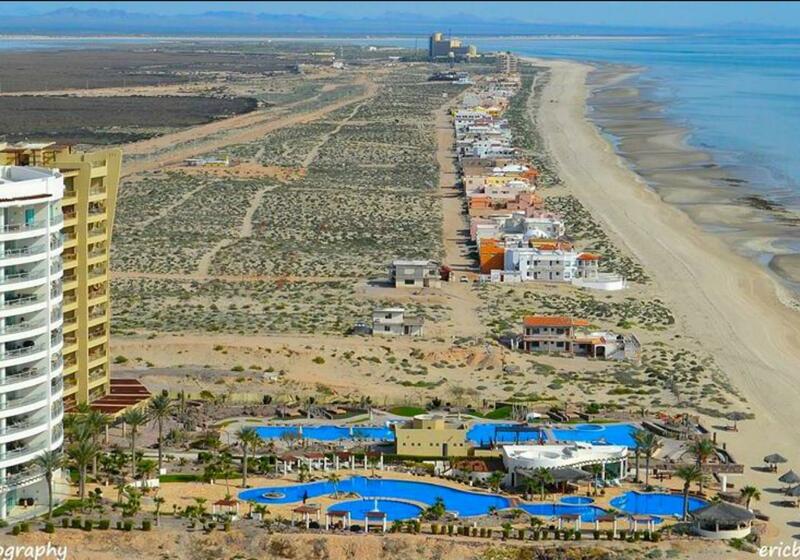 Playa Encanto M41 Lot 12, Puerto Penasco/Rocky Point, Sonora, For Sale by Grant MacKenzie Sr. Lot Size: 7747 sq. m.
Spectacular beachfront home has 4 bedrooms and 3 ½ bathrooms on Playa Encanto's pristine beach is exceptional in every way. Shows pride of ownership immediately! Palm trees welcome you as you enter through a unique dutch door entry with a secluded cozy fireplace. Continuing the ambiance is a beautiful water fountain in a one of a kind courtyard full of lush greenery and charm looking out to a dynamic oceanfront view. The great room concept, has a boveda ceiling, fireplace, temperature controlled free standing wine cellar, and a wall of windows looking out to the sea. The large gourmet kitchen has a Monogram gas stove with griddle, lots of counter space for entertaining; seats at least 8, walk-in pantry and plenty of space to have family and friends join in the festivities always happening in a kitchen. Plus more dynamic oceanfront views. Master bedroom is oceanfront, with roller shades and blackout screen. The adjoining bathroom has a Jacuzzi tub, double sinks, and walk-in closet. The powder room is off the hallway leading to a guest bedroom with king size bed and bathroom. Two additional guest bedrooms are on the opposite side of the home and have a large jack and Jill bathroom with double sinks. One has a private door from the courtyard and can be a lock-off bedroom. The laundry room has a sink and freezer. You have custom tile throughout, new mini splits, roller shades from well known Hacienda del Sol furniture store, fans throughout; more features to follow. Enjoy 1,885 square feet of “Oceanfront” patio that has two large palapas, hot tub seating 8, beautiful tiled furniture and new glass block which completely encloses the breathtaking patio. The oceanfront views are beyond words; you can catch the morning sunrise and the ruby red sky of the evening sunsets from the spectacular margarita deck. Please call us for your private tour. We believe the ambiance of this home will take your breath away. It's perfection for family gatherings, parties with friends and special occasions you'll remember forever. Perfect for building your legacy on the beautiful Playa Encanto beach and creating traditions of a lifetime. Oversized two car garage with room for beach toys. Additional 2 car paved parking space. All palm trees and greenery are established. There's an outside shower for your convenience. Small office space nook off the great room. Washer, dryer, and freezer in large laundry room. Built-in closets and dresser space throughout. Computer desk in one of the guest bedrooms. Stone columns in courtyard look like wood. The wine cellar holds 750 bottles. Listing Agent: Grant MacKenzie Sr.